Have you recently gotten hitched? Then you might want to think twice about your facebook usage, because apparently an astonishing 80% of U.S. divorce lawyers have said that social media evidence is now cited in divorce cases as one of the reasons a marriage has come to an end. 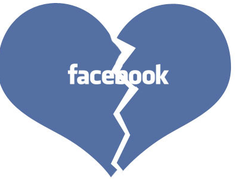 In fact one in five doomed married couples have cited Facebook by name in their divorce proceedings. Apparently the majority of cases revolve around users who get back in touch with old flames/ex-girlfriends, who they hadn’t heard from in years With everything from flirty messages to photographs, cited as the proof of unreasonable behaviour or irreconcilable differences.